Thank you but we are no longer accepting sponsorships for Race2Prague 2019. Blizzard Ponies has smashed the target of £750! Wishing you both all the best in your brave challenge. Good luck! Hope it's going well. Amazing fundraising you're doing for MND Scotland. Good luck with it all and congrats on the fundraising! Ruth is an inspiration to all sufferers of MND.She continues to lead a fairly active life and her friends in Omagh ,Northern Ireland are proud to hear of her day to day achievements. Good luck to all involved and much love to you Ruth! What a great idea. You go girls! Wishing you the best of luck and what a wonderful thing to do! Ruth inspires us all!!! Best of luck to both Audrey and Sara ! Safe journey ! I’m full of admiration Audrey and Sara, and am looking forward to hearing all about your journey. Peter told me to do it. What's the hashtag for this race?! GOOD LUCK, GIRLS! FROM FERELITH - friend of the inspirational Ruth Porter! Hope you reach your target for a great cause! You’ve got this!! Good luck!! Yay! Way to go! Exciting times!!! :D Greetings from Taiwan! You're both amazing! Hope you raise the amount you're aiming. Best of luck!! Wear loads of warm clothes! And have an amazing adventure!! Good on you girls - go for it! 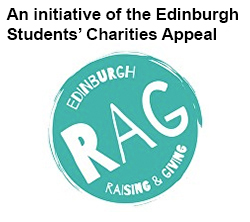 ESCA is led by a student fundraising group who go by the name Edinburgh RAG. They put on numerous events throughout the year including a hitch hike race to Paris and the Meadows Marathon raising money for a wide range of charities. can also upload your charity's logo as your profile if you wish.